For the first time ever, A&M is bringing the magic of Sting’s live show to your living room. This marks the first DVD release for the artist with many to follow. This brand new day tour date was filmed at the Universal Amphitheatre in Los Angeles and features every song from the Brand New Day album, as well as favorites like “We’ll Be Together,” "Every Little Thing She Does Is Magic,” and “Every Breath You Take.” It’s a must-have for anyone who hasn’t had a chance to catch the show live as well as any Sting fan. DVD: Standard 1.33:1; audio English DD 5.1; subtitles none; single sided - single layered; 18 chapters; rated NR; $24.98; street date 9/26/00. Reason number 872 why I hate REM: their arrogance. Back in 1995 as the band geared up for their "Monster" tour, bassist Mike Mills spoke to "Rolling Stone" magazine about the upcoming trek, the band's first in five years. He commented upon how important it is for bands to play live. To paraphrase, he related how the Police were a tight little post-punk act in their early days, but once they became an "art project" and stopped touring, they became useless and irrelevant. Even after five years, I still find Mills' hypocrisy to be stunning. First of all, though "Monster" marked a return to harder-edged guitar rock, over the couple of albums prior to that release, REM had largely indulged in the kind of "artsy" experimentation for which he condemned the Police. During that period, REM did not tour; before 1994's "Monster", their last outing occurred in support of 1988's "Green", though that trek didn't happen until 1990. Not only was Mills a hypocrite, but he was wrong. Despite his allegations to the contrary, the Police never became a "studio-only" outfit. Yes, their albums became more and more complex, but they still supported each one with extensive tours, through and including their hugely-successful swansong, 1983's "Synchronicity". Even after the band split and Sting went off on his own, the consistent touring continued. As a matter of fact, Sting has played in support of each of his six solo albums, beginning with 1985's "The Dream of the Blue Turtles" up through 1999's "Brand New Day". REM can't even tour behind two albums in a row, much less the eleven straight backed by Sting (with and without the Police)! Unfortunately, not all is positive in relation to Sting's live performances. I've seen him on each tour since the 1981/1982 outing behind "Ghost in the Machine" and I'm afraid his live shows have definitely declined over the years. I can't offer many comments about the January 1982 Police gig I saw because I was too inexperienced; it was only the third show I'd ever seen. I had a few more under my belt by the August 1983 concert, which I found to be pretty solid, and was much more experienced by the occasion of the August 1985 solo performance I witnessed. In my opinion, Sting's first solo tour remains the pinnacle for his career on his own. It all seemed fresh and exciting, and he was backed with a tremendously solid band. Branford Marsalis provided a fine onstage foil for the boss, and entire ensemble created an energy that made the shows sizzle. For the most part, a similar power inhabited Sting's 1988 shows in support of 1987's ".Nothing Like the Sun", though they weren't quite as strong as the 1985 gigs. Marsalis and some other musicians carried over from the earlier band, but a fair number of changes occurred. Nonetheless, the energy level remained high and the concerts were quite solid. Unfortunately, Sting's shows in the Nineties weren't as entertaining. His 1991 tour found him with a completely-revamped band and a much more bland presentation. Instead of Marsalis, Sting's main partner on stage now became guitarist Dominic Miller. (Sting played guitar on his two prior solo tours and returned to the bass on this outing.) Miller's technically proficient and an able musician, but he has absolutely no personality whatsoever, and none of the other band members did anything to spark the proceedings either. As such, the 1991 shows were musically-competent but generally somewhat lifeless affairs, and the three tours Sting has mounted since - 1993/94, 1996, and 1999/2000 - have all been virtual clones of that presentation. Miller continues as his guitarist - he's the only carryover from the 1991 band - and the shows remain listenable but fairly dull. In a way, Sting's albums have followed the same pattern. While with the Police, each of their five albums seemed different; their sound slowly evolved from record to record, and though they all feel like the work of the same band, there are few songs that could easily be transplanted from one album to another. That trend continued during his first two solo records, though the differences seemed more subtle. And then - bam! Sting hit a wall. If you examine his four albums from the Nineties, they're virtually interchangeable. He latched onto a fairly gentle VH1-ready sound he liked and has done little to deviate from that tone since then. Yes, he presents a fair number of stylistic changes within each work, from pop to country to jazz, but the results all still seem fairly even, and one could easily take pretty much any song off of, say, "Brand New Day" and drop it on one of the others and no one would notice the difference. Don't get me wrong - I still enjoy Sting's work. However, I fail to generate much enthusiasm for it. His music has become too generic for my liking, and it lacks many distinctive qualities. The workmanship seems solid but the inspiration fails to appear. On the DVD of Sting: The Brand New Day Tour Live at the Universal Ampitheatre, we find an October 1999 representation of his current act. I saw him live in June 2000, and I thought the DVD portrayed what I witnessed fairly effectively, though Sting seemed more lively during the Universal show. No, he doesn't do a whole lot, but he showed a little spark and energy that he lacked when I saw him locally. This still doesn't make the concert rival the shows he put on in the Eighties, and I doubt he'll ever go anywhere with drowsy Miller in his band. To be fair, there's not a lot of energy coming from any part of Sting's group; they all seem like competent but disinterested participants. Actually, I can't recall the last time I saw a group of musicians who appeared so completely uninvolved with each other. Usually different folks interact, but that rarely occurs here; it's as though each of them resided in their own little sound booth and they can't have any active dealings with the others. Actually, this tendency makes the show more entertaining as home video viewing than as a live performance. Frankly, I found much of the concert to be boring when I took it in live last summer. Granted, it didn't help that I'd just seen three Springsteen shows and two Bowie performances the week prior to Sting's concert; since Bowie and Bruce are easily the two best live performers I've even seen, it was hard for me to adjust to anyone less talented. Even without that factor, however, I still wouldn't have thought much of Sting's show just because I like to have some sort of visual stimulation when I watch a concert. The stage is a very simply affair, and the lighting tends toward light reds, blues and yellows. The biggest flash we see happens during "Desert Rose"; some fake fire effects that use paper and wind appear. It's a very conservative stage. No, I don't require dancers, lasers and explosions; neither Bruce nor Bowie indulge in such antics and their shows are as good as it gets. I just want something interesting to watch; otherwise I might as well stay home and listen to the CD. Or watch the DVD, as in this case. Actually, this program perfectly complements Sting's live show: it's a well-executed but bland presentation. The concert was filmed and edited in a most conservative manner, with no flashy camera moves or any kind of quick cuts. It's a fairly unexciting way to show the concert, but it works pretty well, especially since more daring techniques would have seemed so inappropriate here. I've seen concert videos that try to use effects and editing to "spice up" a performance; McCartney's Paul Is Live becomes almost unwatchable due to such antics. As such, Sting Live is a moderately entertaining but fairly unexceptional concert video. It represents the show itself pretty well, which isn't a terrific compliment. I like Sting, and I'll continue to see him live, but I do so with somewhat low expectations. When you witness a Sting concert, you'll get a musically competent but drab performance that will likely leave your memory as soon as he departs the stage. Note that although the DVD presents 18 songs, which is a fairly substantial roster, it doesn't include the entire setlist. The following tunes were performed at the October 29, 1999 concert but can't be found on this DVD: "Roxanne", "Mad About You", "Fields of Gold", "Bring On the Night/When the World Is Falling Down You Make the Best of What's Still Around", and "If I Ever Lose My Faith In You". Why'd they cut these songs? I have no clue. Since the DVD only runs about 88 minutes, I can see no reason to omit so many songs, especially since all of them are popular numbers; their absence would only hurt sales. Also, although some publicity materials for the DVD claim that it contains all of the songs from "Brand New Day", this isn't true. The concert omits "Big Lie Small World", so only eight of that album's nine songs appear. Actually, the set features a pretty solid mix of elements from Sting's career, though the Police side seems underrepresented; only three of those tunes - "Every Little Thing She Does Is Magic", "Every Breath You Take" and "Message In a Bottle" - make the cut. "The Dream of the Blue Turtles", Sting's first solo album, is represented by "If You Love Somebody Set Them Free" and "Moon Over Bourbon Street", while follow-up ".Nothing Like the Sun" shows up via "We'll Be Together", "Englishman In New York" and "Fragile". "Seven Days" comes from "Ten Summoner's Tales", while "Lithium Sunset" represents "Mercury Falling". Albums completely neglected? Police titles "Outlandos D'Amour" and "Zenyatta Mondatta" plus Sting's "The Soul Cages". Note that if the six deleted tunes appeared on this DVD, those three absent albums would then be represented; "Outlandos D'Amour" featured "Roxanne", "When the World." came from "Zenyatta Mondatta", and "Mad About You" was on "The Soul Cages". Too bad the omission keep this DVD from offering a better career overview. 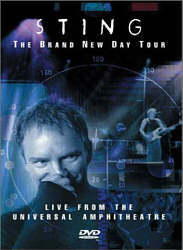 Sting: The Brand New Day Tour Live From the Universal Ampitheatre appears in an aspect ratio of approximately 1.33:1 on this single-sided, single-layered DVD; due to those dimensions, the image has not been enhanced for 16X9 televisions. Overall, this show looked pretty solid, though the original videotaped material betrayed a few limitations that kept it from becoming great. Sharpness appeared largely crisp and accurate throughout the concert. At times, many wider shots looked a bit soft and fuzzy, though this tendency seemed minor and wasn't a huge concern. Moiré effects were absent, but jagged edges cropped up with regularity; guitar strings and curves of instruments often cause such problems, and Sting was no exception. In regard to the source material, almost no flaws were discerned. I saw a blip or two, but no more significant problems, though the general blandness that comes from videotaped programs meant that the show lacked sparkle. Almost all of the colors seen during the concert came from the lights; Sting and the band wear black or other dark tones. The lighting tended to feature warm, pastel hues, and violets, oranges, light reds, and blues dominated the proceedings. The videotapes nature of the program occasionally made the colors seem a little heavy, but for the most part they looked accurate and clear. Black levels appeared slightly pale at times, but they usually seemed deep and rich, and for low-light shots from the stage, shadow detail was appropriately dark but not excessively thick. Crowd views generally seemed much harder to discern, but I don't fault the production for that, since no lighting would be offered for those bits. All in all, the concert looked quite clean and watchable. Also fine but unexceptional was the Dolby Digital 5.1 soundtrack of the concert. Actually, Sting is perhaps the biggest star who supports 5.1 recordings; in addition to this DVD, you can buy DTS CDs of the Police's "Greatest Hits" plus Sting's ".Nothing Like the Sun", "Ten Summoner's Tales" , and "Brand New Day". The soundfield heard on the DVD seemed pretty conservative. From the forward channels I detected decent stereo separation for the music but the mix didn't appear especially broad or well-defined. The instruments were placed in distinct locations to a degree, but they seemed to blend together in too mushy a manner; rarely did particular elements stand out very clearly. The surrounds were used simply to provide light reinforcement of the music and also to transmit occasional crowd noise. For all intents and purposes, this is a stereo soundtrack with a mild surround presence. Audio quality seemed fairly strong. Sting's voice occasionally appeared too bright within the mix, and his vocals sometimes came across as slightly rough, but for the most part, his singing sounded clear and natural. The rest of the music seemed clean and relatively crisp throughout the proceedings. Dynamic range was good, though I thought the mix could have used strong low end. One oddity: at the start of "Desert Rose", the volume level escalates noticeably but returns to normal at the end of the song. Why does this happen? I have no idea, but keep the remote to your receiver handy; you'll likely want to knock down the volume a notch or two before the tune starts. One thing I definitely liked about the soundtrack is that it seemed clear that no overdubs were performed to fix mistakes. The music sounded natural and real, and appears to come completely from an actual performance. These tendencies are best noted through some of Sting's vocals; you can easily hear him strain at times, and I'm pretty sure he messes up the first line to "Every Breath You Take": maybe I'm wrong, but I think he warbles, "Every breath you make". Hey, it may not sound like much, but a lot of performers would have fixed this error, and I appreciate the appropriate rawness that comes across through the audio. Most music DVDs include literally no extras, so it's a pleasant surprise to find a minor addition to this disc. We get 15 minutes and 15 seconds of "backstage footage". This consists of a variety of semi-candid shots of Sting and others involved in the concert as they wait for the show to begin. It also includes a mix of interview snippets, most of which feature Sting's reflections on performing live and touring, but we hear a few lines from other band members and various production personnel as well. It's not exactly revelatory material, but it's a moderately interesting glimpse behind the scenes and it merits a look. Ultimately, I recommend Sting: The Brand New Day Tour Live at the Universal Ampitheater just because I remain fond of his work and no other DVD representations of his music appear, but it's not a great program. The concert itself balanced different sides of his career fairly well, but the performance seemed somewhat drab and lifeless. The DVD offers solid though unexceptional picture and sound plus a nice extra. Sting fans will want to own this, but others may be less interested; I don't think it's the kind of video that will make any new devotees to his music.